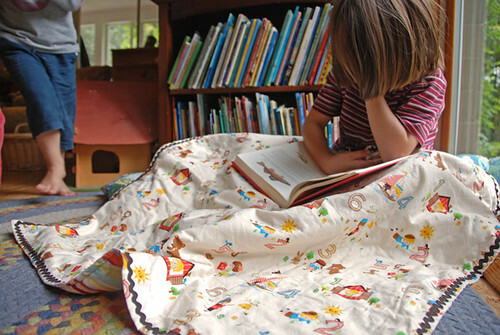 reading corner quilt | Flickr - Photo Sharing! I love the book. Also, that quilt is BEAUTIFUL. Is the fabric a vintage/thrifting find? LOVING it! Especially the brown ric-rac. You're inspiring me to make a no-nonsense throw to compensate for the fact that I won't have your bird quilt around for another few months! Oh I love that quilt!! Such a good idea for time-pressed crafty moms like me. I love an instant gratification craft--you've inspired me.